This weekend in the GTA we got a little taste of the weather that will be on our doorstep in no time (it really cooled down, a high of 10oC? GAH!). It was definitely a weekend for hibernating indoors, which usually leads to some good eats. 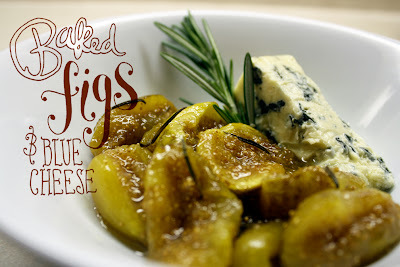 Last week I saw this recipe for baked figs with gorgonzola on the Design Sponge blog (and if you have not heard of it, shame on you!). I was sold on the photo alone! This recipe was incredibly easy and pretty damn satisfying (considering I'm a glutton for chocolate and icing). Dolcelatte was tough to find so I used a creamy blue cheese (33% M.F. I believe) which cut the sweetness of figs beautifully. I totally recommend this recipe for a cool autumn day, your home will be filled with the scent of rosemary and sweet honey- need I say more? Add some biscotti for dipping/spreading and you're good to go! Oh Anil, I would love to have some of this!